A word of advice: don't bring up the merits of advertising to a group of designers. As the stuck-up bunch we are, many of my cohorts would say that the art of advertising is not really an art at all, and has little to do with anything except suckling money out of hard-working people for the gain of big-wigs and capitalism in general. Well, that may well be true. But I have found a piece of advertising that I believe to be personally ground-breaking and refreshingly honest about what it means to be a woman. And shockingly (or maybe not so), this piece was created by a man. I won't leave you in suspense any longer. Please do click to see it enlarged. 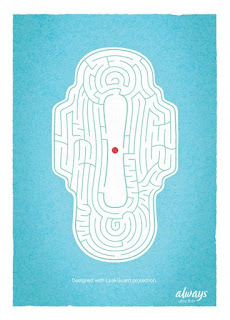 Instead of that stupid blue liqiud that someone decided would forever represent the female menstruation cycle in all its horror, we have a truthful rendition staring us in the face. Not only that, but it is represented in a fun, interesting, and extremely visually pleasing way. Don't you find yourself following the lines, trying to find a straight shot through the maze? Maybe I'm interrupting your search. I'll give you a minute to find it. Willy Chyr is an artist working at the intersection of art and science. His work spans a variety of media, including web, print, and installation. 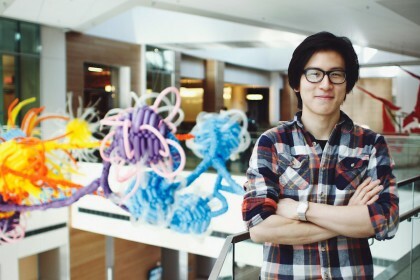 Drawing inspiration from both cultural artifacts and scientific knowledge, he creates platforms and systems that replicate processes found in nature. The rabbit hole goes deeper, readers. According to the page for the ad on his website, Chyr states that he actually created the advert for his personal portfolio. It grabbed the attention of the right people at the firm where he worked, Leo Burnett, and soon it was an actual ad being run for Always. Chyr left the firm in the midst of all of this kerfuffle, and was completely unaware of the fate of his design until he saw it in a magazine while shopping at Target. It went on to win three awards: the 2011 Chicago Silver ADDY Award, the 2011 D&AD - Shortlist , and the 2011 New York Festivals - Finalist Certificate. Big news for a small red dot. Let's go back to his self-description. At the intersection of art and science, you say? 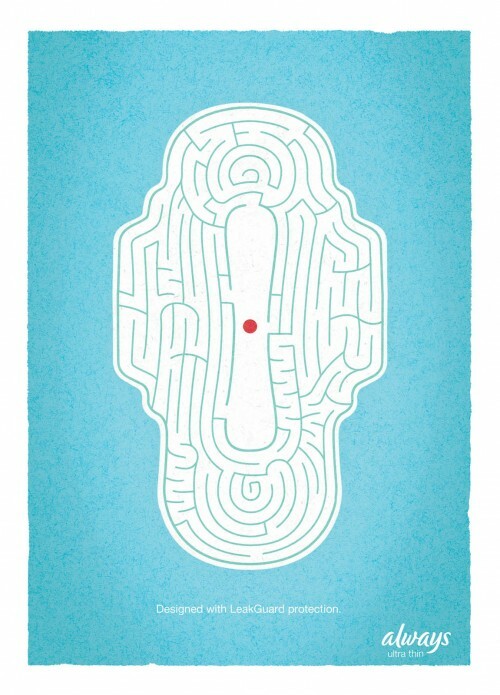 There is much more to this Chyr than his feminine hygiene obsession. 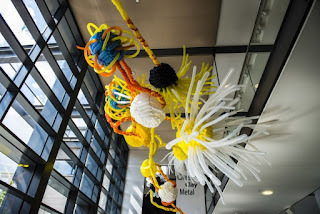 He also makes wonderful fantastical balloon art! Shown below is a commission for the atrium of the Lawrence Arts Center in Kansas. He has aptly named it "Sunflower". There you have it. Advertising can be thoughtful and really make you revalue how you see the world. Visit his website here. The man behind the balloons.